Platt Tech, Foran & Law High School students can earn big bucks from Key Hyundai of Milford! Didja hear? Key Hyundai is getting quite popular in high school! 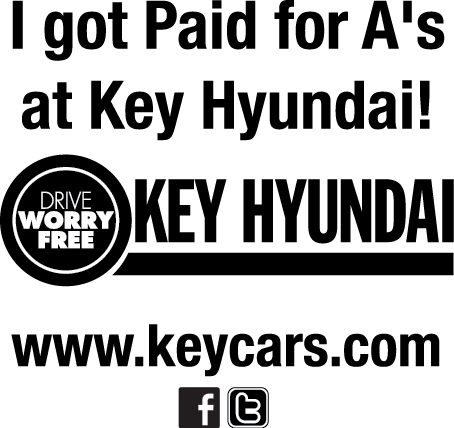 Key Hyundai is launching Pays for A’s, rewarding Milford high school students from Platt, Foran and Law with cold, hard, gift cards for each academic A received on their report card. That’s right. $$ for good grades for Key Hyundai of Milford. We’re just another automotive sponsor supporting our local schools; but this time we’re putting our money where the hard work is: in the students’ grades. There’s much controversy over paying for grades, but this is strictly a business decision, the brainstorm of my fabulouso General Sales Manager Sal Sinardi. When asked to purchase an advertisement in Milford’s Foran High School’s athletic program, he didn’t opt for the same ol’, same ol’. Sal wanted something different. Something to excite the kids, get the parents into the dealership, and create a little fanfare. And Key Hyundai Pays for A’s was born. We’re forking over a $10 Westfield CT Post Mall gift cards for each A. But there’s a glitch: the gift cards only come in $20 denominations. Key Hyundai Rounds UP to bring Milford High School students MORE for their hard work! So one A will net a student a $20 gift card. Two A’s: same. Three A’s = $40 in gift cards. Fuzzy math, but the kids end up winning! Platt Tech, Joseph A. Foran High, and Jonathan Law High School students are all eligible to participate. They need only earn the A’s, then bring in their report card, student ID, and a parent to receive payment. It’s simple really. We get high achieving students with their parents walking through our showroom. Hopefully eyeballing some cars, perhaps taking a test drive. Perhaps not – but now Key Hyundai is on their radar, and will see with their own eyes what we have to offer. It’s a pilot program. We’re learning as we go too. If all goes well, we’ll roll out to Manchester/Vernon as well. But for now, Milford students are the guinea pigs. Get to work kids, study hard, and come on in to collect!